What’s better than having 4 people live in a small trailer? How about 5 people living in a trailer! For our trip to the Portland, Oregon area, my mom courageously flew out to travel with us for a week. Frankly, I’m still surprised she came because she certainly had enough information from this blog to warn her of all the dangers. However, my mom’s a tough lady and it was awesome to have her along for the adventure. Upon her arrival, we first went out to the Columbia River Gorge for some hiking and sightseeing. The gorge is massive (miles and miles long) and is impressive to say the least. After a visit to the Lewis and Clark Discovery Center and watching scientific’y movies and information displays there, we still can’t tell you how the gorge was developed other than it isn’t a mountain range and it is formed by a lot of different geological events taking place across thousands of years (ironically, that was pretty much how I answered every question in my earth science classes in high school – you can guess how those grades turned out). The hiking along Columbia River Gorge is stunning, but with the recent Pacific Northwest heatwave, it was more of a challenge than we bargained for. You’re probably guessing that my 60+ year old mom was holding us back, right? Not so – I was the weakest link and my yoga instructor mom coming off a cross country flight and fighting jet lag was crushing the trail. After seeing the Gorge, we drove Tin-E into Portland where we had booked an AirBnb for a couple nights. The house we booked was described as “Unique Zen Home” online. Sounds enlightening! We did this as there weren’t many good RV Park options near Portland and we wanted to explore the downtown area where parking for the trailer is a no-go. Excited to stretch out in a house larger than 140 square feet, we made our way to the Multnomah Village neighborhood. Driving up we notice that the house we AirBnb’ed has a “Sale Pending” sign out front – what an industrious (or sneaky) person!? They are in the process of giving this house to another owner and they’ve decided to let heathens like us rent it? I’m still undecided whether this is ethical, but at the time I didn’t care as long as we got to enjoy the house and the new owners didn’t kick us out. Once the shock of the sign wore off, we made our way in. The house was nice, open, and had a good vibe to it. I can see why someone would want to buy it. However, it was dirty. Not just a little bit dirty, but ants all over the kitchen dirty and not a vacuum in sight. Come on lady, your wifi password is “mindfullliving” but you aren’t mindful enough to clean the house? After sending off a nastygram email, she was “helpful” enough to give us the cleaning fee back and drop off not one, but two, tiny ant traps. Someone cares about this house not at all. Multnomah Village is a sweet neighborhood and our first night in Portland concluded with a walk around town and “fancy pizza” at Tastebud. My mom brought several magazines and newspaper clippings on “things to do” in town. One of them was “what to do on your weekend in Portland.” Have you ever tried to do everything that’s listed in one of these articles? It’s ridiculous and goes something like this: “Wake up at 6:45am and get a latte from the world’s greatest coffee joint that is located in a hidden warehouse in the southern part of town. Then jump on your fixed gear bike and get the freshest marijuana infused donut at 7:25am from Smokey Joe’s Doh-nuts in the northern part of town. Then ditch your bike and hop on the Max trolley car to be first in line to see the Japanese Garden before anyone else. Then, get your second latte of the day at 8:15am from Portland’s best espresso truck, only this truck never stops and you have to use a freaking special app to find it and be Usain Bolt to chase it down.” I nearly had a nervous breakdown just reading this article and if the author truly did everything he said to do, then HE is the most interesting man in the world or the weed he got from one of Portland’s pot shops was laced with meth. Reading this “example weekend of Portland article,” we decided that if we could do five or six out of the fifty two items listed, that would be a success. Shoot, if we could make it out the door by 11am and back home by 6pm without a kid having a meltdown, I’d probably buy Unique Zen Home myself and never leave Portland. First on the list, the “world famous” Japanese gardens in Washington Park. 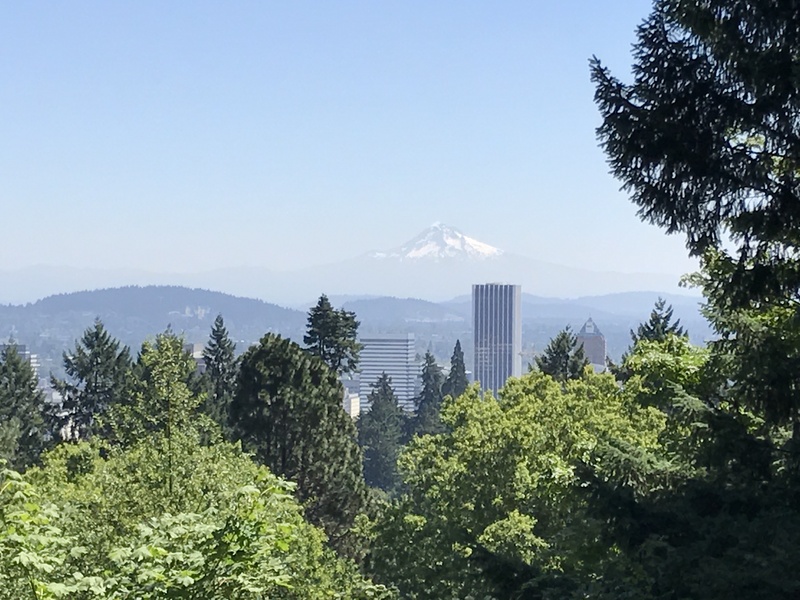 The gardens are nice and provide a great view of downtown Portland. Think quiet, peaceful and relaxing right? WRONG! THINK EPIC MELTDOWN WHEN YOUR DAUGHTER LOSES HER S.H.I.T AFTER DROPPING HER NEW PINK BUTTERFLY BINOCULARS INTO THE KOI POND! You’re welcome Japanese Garden visitors because here’s your opportunity to REALLY practice some Buddhist teachings and not punt my kid into the koi pond like I wanted to. After that episode, we were satisfied that we had checked off “one item” from our list and decided to let our luck ride and go for “item number 2”, a food truck pod. Food truck “pods” are the greatest. They’re basically just a bunch of food trucks close to one another. It’s great because you can get a taster of all sorts of different stuff at food truck prices, which we did: 3 Chinese dumplings, 1 bubble tea, Polish cheese blintzes, Iraqi tabouli, and Thai chicken. Amazingly, all the food was good, but the winner was the strawberry and cheese blintzes that were served up by an old Polish Grandma. With food in our bellies, we realized that the food truck pod was just down the street from Powell’s Bookstore, THE BEST BOOKSTORE in all of the world (or at least Portland). We weren’t there long, but the store is crazy impressive. It’s about the size of a Best Buy and I felt sufficiently hipster walking through the aisles with my bubble tea and oversized stroller in tow. Check off item #3 “thing to do in Portland”. Day #2 in Portland started off with a visit to the Saturday Art Market and then to the Farmer’s Market at Portland State University. I highly recommend that your Portland trip take place over a Saturday so you can hit these. We haven’t been planning much on this journey, but my mom deserves credit for making these markets a part of our itinerary. Without visiting the markets, our Portland stay would have been a little pedestrian. You go to a town like this to eat great food (check) and drink loads of IPAs with fancy ingredients all night (no check). Visiting the markets made up for not being able to pretend like I’m 17 again and come home drunk and have to face my mom with Beast Lite breath. After the markets, we got our Voodoo Donuts and Stumptown coffee which pretty much wrapped up our weekend in Portland. Thus, we checked off 6 items from the article, but when you have two kids under the age of 5 in tow, 6 counts as all 52. But wait, there’s more! With Mom in town, we were Oregon tourist machines and her trip wouldn’t be complete without a visit to the Oregon coast. I’ll spare you the details other than to add that we had a wonderful time at Nehalem Bay State Park, Cannon Beach, and a secret spot at Oswald West State Park which was the best out of the bunch. Also, we got to celebrate J and E’s birthdays with a special My Little Pony piñata. E might not have had many kids other than Lil D at her party, but she got unlimited whacks on Pinkie Pie until her head popped off (the piñata not E). We covered a lot of ground over 6 days and I am extremely grateful for having a Mom that is both strong enough and crazy enough to spend all day with this wild bunch. It was a real treat to have her out West with us and bridge the gap between our life on the road and life back in MD. Much love to visitor #1 (THE BEST MOM IN THE WORLD) and you’re welcome back any time! Now who wants to be visitor #2!? Many thanks for sharing your tiny space, precious time and big adventure. Loved every minute. Loved every minute? Even the Japanese garden debacle!? One of those Buddhist teachings from the Dalai Lama -Do not let the behavior of others destroy your inner peace. Don’t know if this is a Buddhist teaching but…the “bad” times make you appreciate the good times more. Danny, i have enjoyed your blogs. This is a great experience for you and your family.I will leave you with one thing I tell my children and grandchildren.” one door closes and another door opens”. Thanks for your mentoring of Vince as he starts on his new adventure.